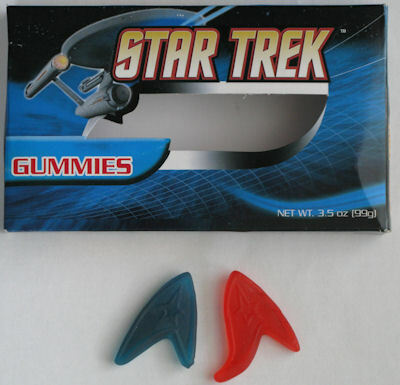 You may remember that we mentioned Star Trek Gummies a while back. Well, I finally had my chance to try them at the All Candy Expo and found them delightful. Anyway, I must say that first tastes did not deceive. These are absolutely delicious gummies. Two colors/flavors are included, both in the shape of the uniform patch from the original Star Trek (in later series, that patch is a communicator… but I’m showing my geekiness again). Red seems to be strawberry, and is a wonderful, sweet, fruity morsel. Blue is, I believe, raspberry, and is nearly as good as the strawberry. The best thing about these gummies? They’re soft. I’m talking really really soft. And the perfect size, too. The patch is very well executed, with enough detail to be able to easily tell what it is, even when they’re slightly misshapen from Florida heat (see the red one above). Honestly, they’re a pleasure to eat. The only downside? There’s not enough in the box! I need more! So if you’re off to see the new Star Trek movie again (because let’s face it, what are the odds there are geeks out there who haven’t seen it yet – except myself sob), see if you can track down a box of these beauties. Your Spock-eared friends will be so jealous! I have no idea where you can buy these online, but the website says you can contact them to find someplace local to you that might be carrying their products. Good luck!